The Columbus Zoo and Aquarium will be home to seven California sea lions in 2019. Zoo officials are preparing a habitat for the marine mammals, which are currently being housed at an interim facility in Florida until their new home is ready. Thanks to the support of voters who passed the last levy and contributions from generous donors, the Columbus Zoo and Aquarium is building a brand new, state-of-the-art sea lion habitat. In preparation, seven California sea lions are settling into their custom-built interim home in Florida while they await the opening of the new habitat in 2019. The zoo has already begun designing how the new sea lion habitat will fit into its existing footprint and expects to break ground this fall. Although it’s too early to have a detailed layout of the habitat, it will have the same spaciousness and naturalistic feeling as some of the zoo’s other habitats, such as Polar Frontier and Heart of Africa. Although the sea lions were born at different facilities all over the world, they have lived together for about 10 years at a marine park in Shanghai, China called Changfeng Ocean World. The park was looking for the best possible new home for their sea lions and chose the Columbus Zoo. The animals’ social structure is a very important consideration for their wellbeing, and the Columbus Zoo and Aquarium is in the unique position of both planning a new sea lion habitat and having the capacity to keep all seven animals together to preserve their social structure. “Animal care is our first priority at the Columbus Zoo. 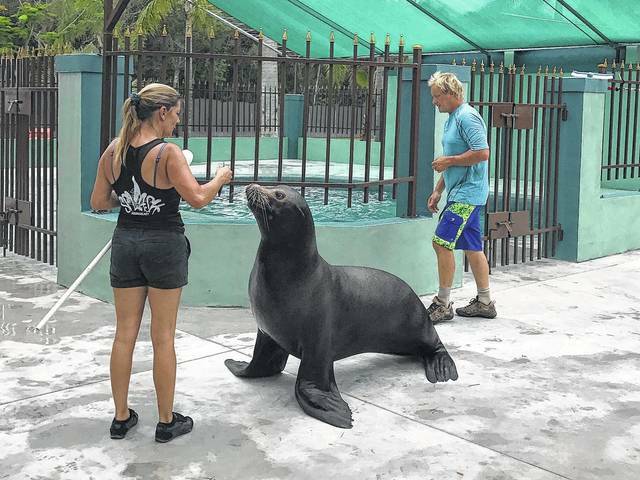 That’s why we have two staff members living full-time with the sea lions while they are in their interim home in Florida,” said president and CEO Tom Stalf. “It’s also why we are designing the habitat here in Central Ohio with the animals’ needs first. One reason the zoo is adding the new habitat is to further its commitment to sea lion rehabilitation efforts led by institutions accredited by the Association of Zoos and Aquariums. The Columbus Zoo has provided financial support for years for rescue and rehabilitation efforts by the Marine Mammal Center in Sausalito, California, and three of the zoo’s veterinarians have each spent a month aiding the MMC with the stranded and injured marine mammals it works to nurse back to health while expanding their knowledge of sea lions and seals. Although California sea lions are not listed as a species of concern, the situation for wild sea lions is increasingly dire because there are a rising number of pup strandings. As climate change forces the mothers to hunt further away from shore, more of them are not coming back, leaving pups orphaned and unable to care for themselves. The MMC takes in many of these animals and works to restore them to health. There are plans for the Columbus Zoo to provide a home for at least one rescued animal in the future and we are working with the National Marine Fisheries Services and the AZA Species Survival Plan to provide permanent homes for non-releasable rehabilitated animals from our partners such as the MMC. Adopting a rehab animal is the next logical step for the Columbus Zoo in strengthening collective efforts of AZA-accredited facilities in North America to care for wild sea lions found injured or stranded. https://www.delgazette.com/wp-content/uploads/sites/40/2017/06/web1_Sea-Lions-4704-Columbus-Zoo-and-Aquarium.jpgThe Columbus Zoo and Aquarium will be home to seven California sea lions in 2019. Zoo officials are preparing a habitat for the marine mammals, which are currently being housed at an interim facility in Florida until their new home is ready.